This winter has been a tough one for colds and flu. It seems like everyone has suffered from a relentless run of coughs, runny noses, and aches and pains. A few weeks ago it was my turn. While lying in bed feeling sorry for myself (as I tend to do when I’m sick) I came across this Instagram post from fellow Nutritionist, Michelle Gottfried. It was a steaming bowl of vegetable broth with zucchini noodles, and it looked delicious. I immediately got out of bed and into the kitchen to make my own version. I added as many healing ingredients as I thought would taste good… bone broth, garlic, dandelion greens, chili paste, and protein. 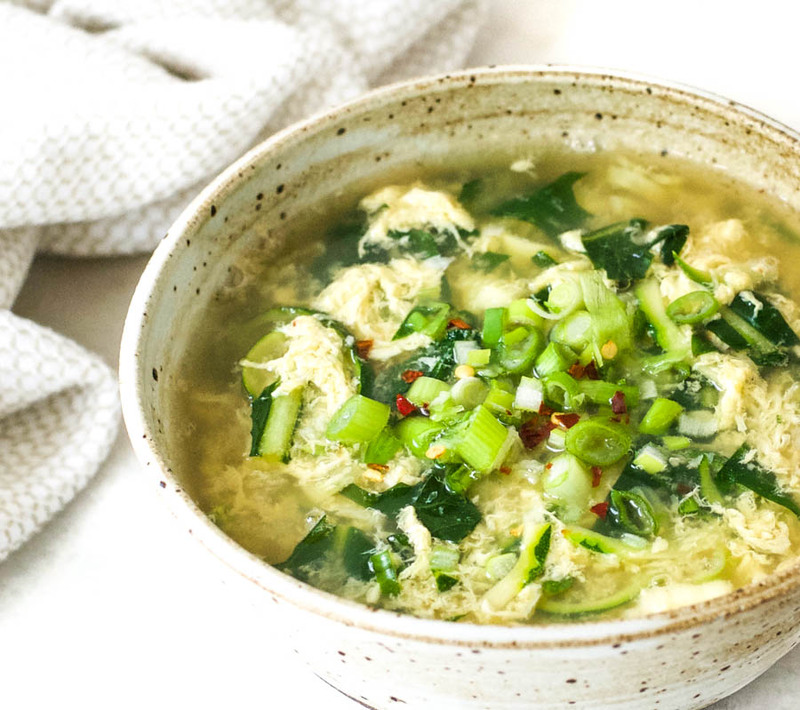 The result was this deliciously comforting healing bone broth egg drop soup. Since posting a picture of this soup on Instagram, I have had quite a few requests for the recipe. So here it is. What I love about it, aside from its wholesome, nutrient-dense ingredient list, is the fact that it is customizable. No need to do a special grocery store run for this one. Don’t have any bone broth? You can substitute with any kind of broth. All out of dandelion greens? Throw in any greens you have on hand. Not into chili? Skip it. 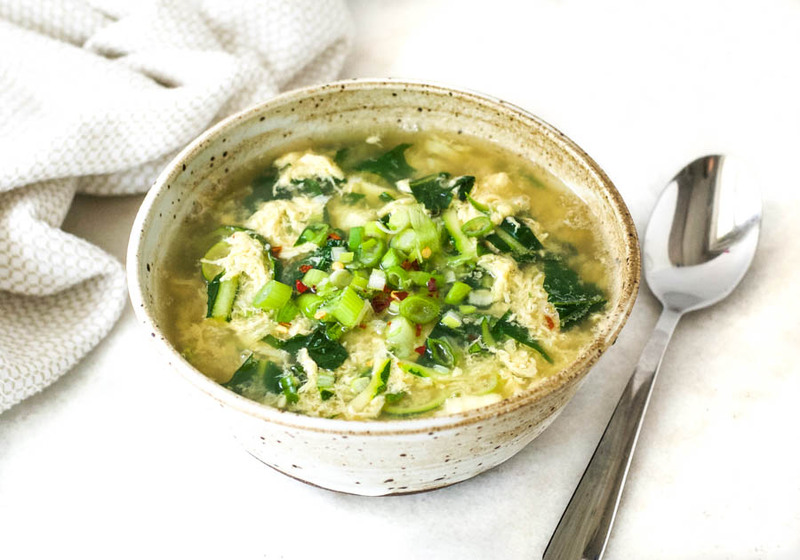 As long as you have broth, some eggs, and some veggies, you can make your own version of this delicious, healing bone broth egg drop soup. In a medium pan put the broth, water, miso paste, chili paste, and tamari/soy sauce. Stir until well combined and heat over a medium heat. Meanwhile whisk the 2 eggs in a bowl and zoodle (or grate) the zucchini . Once the broth is steaming, gently stir it while slowly pouring in the whisked eggs. Add the zoodles, dandelion greens, and crushed garlic to the broth. Warm for a few minutes. Add salt and pepper to taste (and hot sauce if you like it spicy). Serve with the scallions on top. *Please note – nutritional content (especially protein and sodium) will vary widely depending on the type of broth you use. Bone broth can really do miracles in your health. Whenever I’m sick or someone I know is sick, I recommend drinking broth. Sometimes it’s better than drinking medicines right away. I also add some egg on my broth if I want it to be more special. Oh,and some vegetables too! It instantly makes me energized. My favorite is Au Bon Broth, it is very easy to prepare, it goes with vegetables or with any dishes.